The Point Defiance Zoo and Aquarium (PDZA) in Tacoma, Washington is something of a hidden gem of a wedding venue. Maybe the idea of getting married at the zoo sounds too weird, as if you're going to have exotic animals in all your wedding photos. In reality, the PDZA, and the Asian Forest section in particular, has lots of beautiful settings for bride and groom portraits. Sure, there are a few animals worthy of being in your wedding photo (did you see the tiger in the background of a different portrait in this gallery?) but mostly there are settings like this one: an attractive bench in front of a bamboo wall. 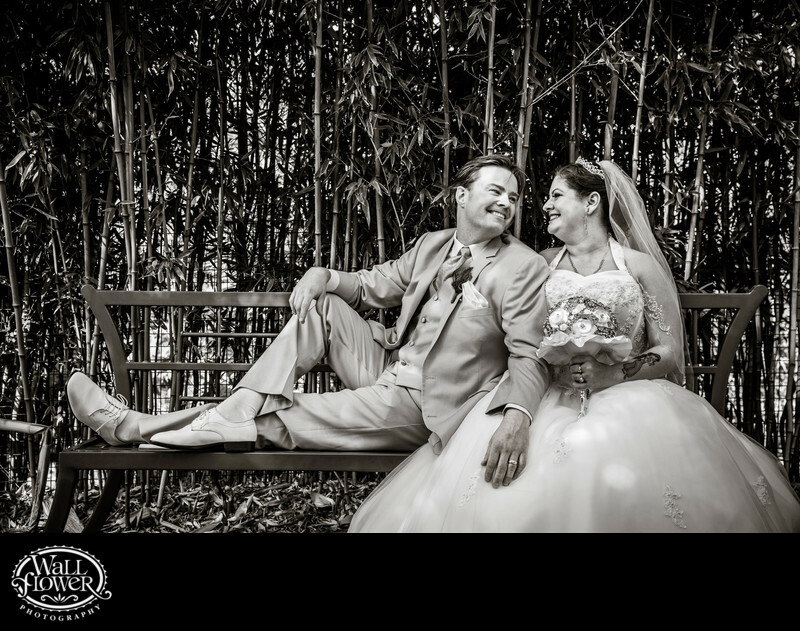 The bride and groom's poses and expressions are flattering and natural, just what we work toward at every wedding, and the black and white effect keeps your focus on those expressions instead of all that vibrant greenery behind them.